Ahh, Italia. Cultural mecca, bastion of romance and passion. One pictures bustling city squares and impossibly idyllic countrysides. Allow me just a few more cliches here, because, hey, it’s Italy. And how can we talk about Italy without also mentioning the sound of opera, the smell of garlic, and the taste of tomatoes, oregano, and basil on a warm bowl of pasta al dente? Let’s face it: the place has got a lot going for it. It’s no surprise, then, that Italy is home to some of the world’s finest fromage. Aside from the obvious candidates like mozzarella and parmigiano, Italy has hundreds of other delicious cheeses on the menu. There are a couple of things that every fromageophile should know about Italian cheese. One is that several of these cheeses are protected under the DOC label, which is crucial in preventing the dreaded cheese identity theft. Modeled off of the AOC of their French neighbors, the DOC label lets you know that you’re eating the real deal and not some overprocessed, mass-produced fromage impostor. Italy’s cheeses (again like their French counterparts) are also very specific to region and culture. And Italian people cherish their cheeses with amounts of gusto that would rival any Frenchman’s. But while the French subscribe to an all-encompassing, Vive la France! type of CheesePride, the Italians are much more, shall we say, regionalistic about things. In fact, each region values its cheeses to such a degree that it would be nearly impossible to visit one region and order up a cheese from a neighboring region. With all this in mind, we held a modest Southern Californian FDM Summit with the goal of sampling Italian cheeses from a variety of regions. As is customary in fromage tasting, we went for the milder cheeses first. Pantaleo [pahn-tuh-LAY-oh] is a rare goat cheese from the island of Sardinia. Off-white in color, its taste has been described as “fruity yet herbaceous”. It is uncharacteristically hard for a goat’s milk cheese and is aged for a minimum of 100 days. We tried it with honey, which was recommended, and a San Diegan IPA, which was not. Piave Vecchio [pee-AH-vay VEK-ee-oh] is a cow’s milk cheese that hails from the Piave River Valley of Belluno, in the northern region known as Venetto. It’s aged for six to fourteen months and is yellowish in color. “Vecchio” means “old”, and one can even purchase a Piave Stravecchio (“extra-old"). The flavor intensifies with age, although it should be noted that an “extra-old” Piave resembles a young parmigiano reggiano. Fascinating! Our local cheese shop suggested pairing this fromage with an amber ale; our IPA was an intriguing substitute. We also tried grapes and olives with this fromage. 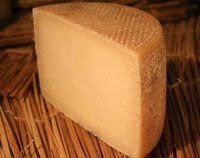 For our fromage finale, we sampled the Taleggio [tah-LEDGE-oh], an exciting cow’s milk from Lombardy. 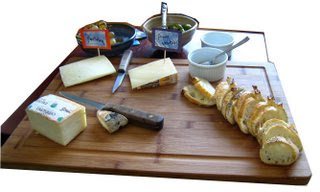 Taleggio is a member of the “washed rind” class of cheeses, which essentially qualifies it as a “stinky cheese”. As a DOC-protected fromage, its rind is embossed with a special mark so you know it’s authentically stinky. Our trusty cheese shop had nearly run out of this one, but they were kind enough to provide us with a couple of leftover scraps for a buck a pop. Not bad. In the interest of comparison, we also purchased a larger block of Tah-Ledge from a nearby healthfood conglomerate. Both taleggios were sampled with the remainder of our IPAs, a delectable pinot grigio, and the aforementioned culinary accoutrements. And also some bread. Our Italian cheesetour was remarkable in several ways that should be noted here. For one, it marked the first FDM tasting in many a moon, which is decidedly a good thing. Second, it took us into uncharted lands and allowed us to learn about some very interesting (and very tasty) cheeses. Lastly, and perhaps most importantly, two new members were initiated into the fold. A huge FDM welcome to Cookie Munster and Kurd Vonnegut! As for the other members, please enjoy our tasters’ reactions and comments as they are posted. And then? Why not go out and get yourself some Italian cheese and join the fun?